Investigators from the Bakersfield Police Department have also confirmed there was an eye witness that observed the homicide, and it’s believed the witness has information that would assist in identifying the suspects. This witness is asked to call the Bakersfield Police Department immediately. In addition to the $10,000.00 reward offered by Secret Witness of Kern County and the Federal Bureau of Investigation, an additional $5,000.00 was donated by Tejon Ranch, and another $5,000.00 was donated by the community to American General Media and the Ralph Bailey Show. The current reward total is $20,000.00, for information leading to the arrest and filing of a complaint against the suspect(s) responsible for the death of Kason Guyton. 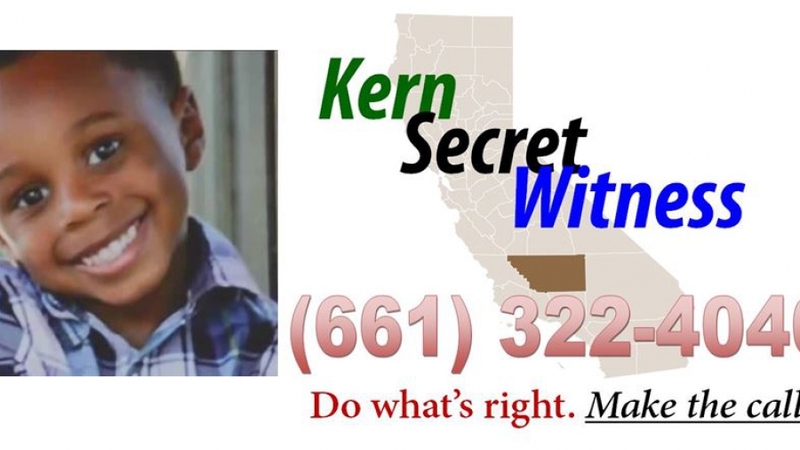 The Secret Witness of Kern County phone line operates 24 hours a day and secrecy is guaranteed to those who call. Anyone with information is urged to call (661) 322-4040. Your contribution helps solve crimes in our community. All information provided will be kept confidential and your identity will never be released. © 2019 Kern Secret Witness.